1. Peel and grate the beetroots and finely slice the onions and garlic. Heat a large frying pan and add 2 tbsp of the oil, the beetroots and onions. Season with salt and pepper. Cook gently for 10 minutes, then add the garlic and continue to cook over a low heat while you make the bases. 2. Preheat the oven to 220ºC, gas mark 7. Line 2 baking sheets with baking parchment. Mix the potato flour and seeds together in a bowl. Beat the egg with 2 tbsp oil and 6 tbsp water, add to the dry ingredients and mix to a pastry-like dough. Add a little more water if necessary. Shape into 4 balls then press them out with the heel of your hand into 12-13cm rounds on the prepared baking sheets. 3. 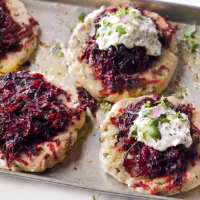 Pile the beetroot mixture onto the bases and drizzle with the remaining oil. Bake for 15-20 minutes, or until the bases are firm. This recipe was first published in Thu Jun 19 14:51:03 BST 2014.